Keep your electronic equipment and mobile devices ready to use with our extensive line of Power Accessories including: Cables, USB Chargers, Power Inverters, Hubs, Battery Banks, and Universal Power Adapters. Wherever you are, whenever you need power, we’ve got you covered with accessories that charge, split, convert, and adapt power to fit your needs. 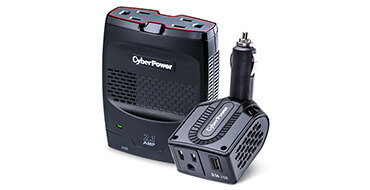 Power Inverters from CyberPower convert automobile DC power to AC power to rapidly charge and power laptop computers, tablets (including iPads), MP3 players, and other USB mobile devices. Our power inverters also supply surge protection to safeguard electronic equipment. Each power inverter comes with a two-year warranty. 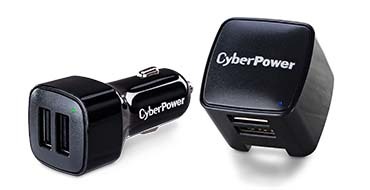 USB Chargers from CyberPower charge and power an array of mobile devices and electronic equipment, including tablets, Smartphones, cameras, PDAs, MP3 players, and other accessories. They are available as car chargers, wall chargers, and power splitters. 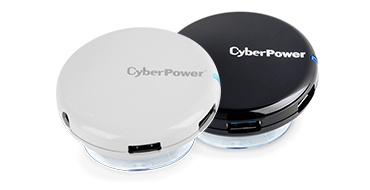 Stay connected wherever you are with CyberPower’s line of universal travel adapters. Our 4-in-1 travel adapters include the four most common plug types to power your devices in 100+ countries around the world, including Europe, North America, South America, China, Japan and more. 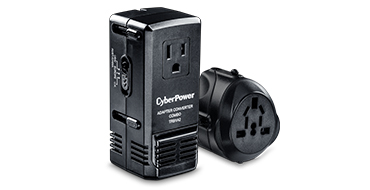 CyberPower travel adapters are compatible with products using both 100-120 and 220-240 volt standards. Select models combine adapter and converter capabilities to safely convert voltages from 220-240V to 100-120V. 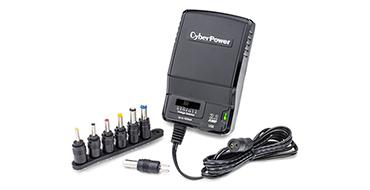 Universal Power Adapters from CyberPower are perfect for powering your electronic equipment and for charging mobile/consumer electronics. Use these compact adapters with tablets, mobile phones, cell phones, portable audio/video products, DVD players, digital cameras, MP3 players, and handheld gaming systems. 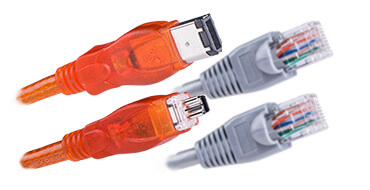 Features for models in this series include a set of adapter tips for different types of equipment, multiple voltage support, a power cord, and a plug. Each Universal Power Adapter comes with a warranty.